Last week, I discussed my top three reasons for hiring a stationery designer for your wedding invitations, as opposed to choosing a template off of a pre-made invitation site, and why it is truly worth the investment for custom wedding invitations. You want your invitations to be unique and one-of-a-kind, just like your wedding will be, so investing in custom stationery is the cherry on top for making your big day extra special. You also want your invitations to reflect you and your fiance' as a couple, not just that they are pretty. 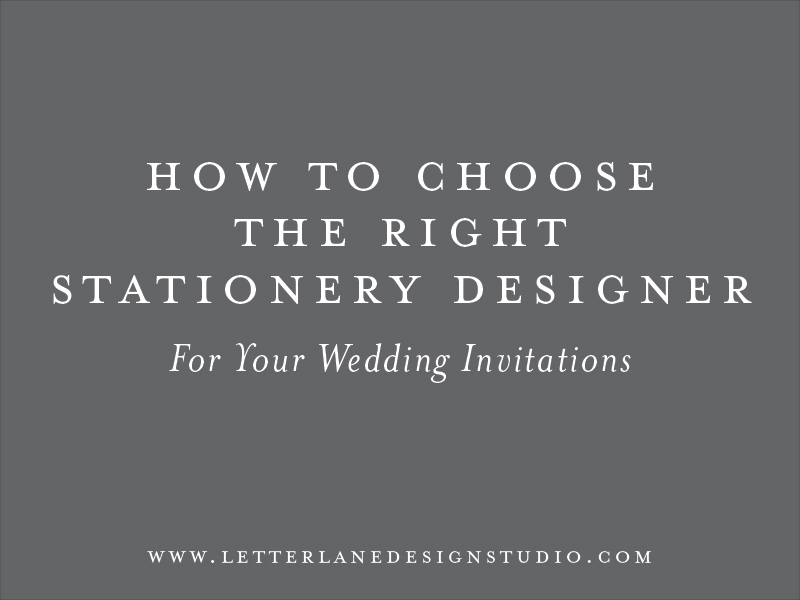 Today, I am sharing my advice for how to choose the right designer for your wedding stationery. Custom stationery for your wedding is an investment, so you want to put that money toward someone that will create invitations you absolutely adore and want to cherish forever. One of the most important things to consider when hiring a wedding stationery designer is whether or not you like their design style and aesthetic. If you don't absolutely love the invitations that they have created in the past, or you don't feel like your vision for your invitations jives well with their design style, then you and that designer probably won't be a good fit. Maybe their design style is simple and elegant, while your vision for your invitations is more bright, fun and whimsical. You want your vision and the stationer's design style to mesh well, otherwise it could make it difficult to work together. If you are officially overwhelmed when it comes to all the details for your wedding invitations (EX: wording, etiquette, timelines, etc. ), your stationer will have your back. When you hire a custom stationery designer for your invitations, there are going to be tons of details that your designer will help you with, and they will make sure that everything is in perfect shape for your invitations. Having a stationer handle your invitations for you will take a ton of a stress out of the process, and they will make sure that your invitations are completed and delivered to your guests right on time. An extremely important part of the custom invitation design process is that you and your stationer's personalities mesh well, that they are able to communicate with you clearly and that they really understands your vision. You want to feel confident that your designer will follow through on their promise to create beautiful, unique invitations for your big day. A phone or Skype call with your stationer will typically last 30-45 minutes, as your stationer will gather details about you, your big day and your vision for your invitations, as well as answer any questions you may have. You budget will also be discussed. Sometimes, a phone or Skype call does not fit into a stationer's busy schedule, or they may prefer to have everything in writing from you, so they may send you a questionnaire to fill out instead. The questionnaire will include all the questions they would normally ask you via phone or Skype. A big advantage of filling out a questionnaire is that you may think of things you wouldn't normally have thought of on the spot while you're on the phone, and it is great for the stationer to have these extra details. Either through the phone/Skype call, a questionnaire or even just e-mail, you will be able to get a feel for the designer's personality and communication style. It's very important that you understand how they prefer to communicate with you (most will want to communicate via e-mail), their timeline for your project and their schedule. Most of all, it's very important that you understand the stationery designer's process. For me, it is best to contact me for your custom stationery needs at least 6 months in advance, but preferably 8-9 months out to avoid any rush fees or errors. Other designers may request more or less notice than this, but it is best to reach out as soon as possible when you are interested in a certain designer for your invitations. At first glance, do I like what I see in this designer's portfolio? What sticks out to me about this stationer's design style and aesthetic? Does my vision for my invitations line up with this stationer's design style and aesthetic? Does their pricing fit within my budget? Do I understand their process for completing my invitations? Am I excited about the possibility of working with this designer? Download my FREE custom wedding stationery & calligraphy timeline to keep you on track for your wedding! Sign up with your email address to receive the timeline via e-mail! Thank you! You will receive an e-mail with your download shortly.